Who can to resist to a warm buttery flaky croissant?! It goes perfectly with a strong cup of coffee. 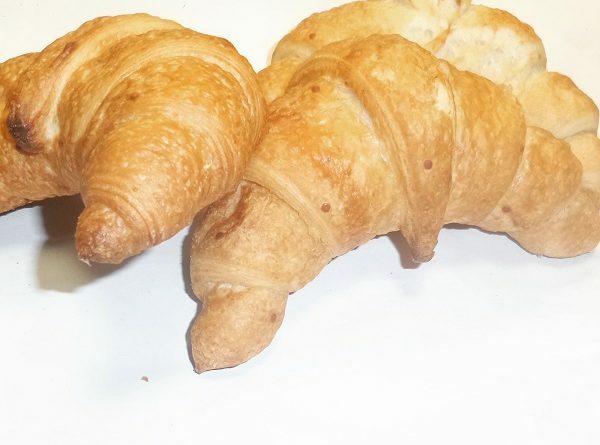 Check this gluten-free croissant recipe. In one bowl, combine flour mix and potato starch, yeast, xanthan gum, honey, add, baking powder, and salt until combined. Add warm water, eggs, and 1/2 cup butter. The dough should be little too soft and sticky to handle as you would regular roll dough. Place it into a Ziploc bag. Refrigerate at least two hours, overnight is preferred, or freeze for an hour. Lightly dust your pie crust bag with extra flour. Scrape the dough into a ball shape and sprinkle a little more flour over the top of your dough to prevent it from sticking. Using a rolling pin, roll dough out to about 14″ circle. Cut the circle into 8 wedges using a sharp knife. Carefully roll each wedge inward to form a croissant. Gently place a few inches apart on a baking sheet lined with parchment paper, and curve them slightly to form a crescent shape. Let the rolls rise on top of the oven while it preheats (15 minutes). Bake for 10-15 minutes in well-heated oven. Flake with a fork in the center of a roll to see if it’s done. Brush with melted butter or oil and serve warm for best results. Store leftovers in an airtight container or bread bag at room temp for up to 3 days, or in the freezer. These can easily be re-warmed by wrapping in foil and placing in a 325 degree oven for about 5 minutes from fridge or 10 minutes from freezer. Making gluten free croissants, too wet to roll, tips? The dough should be little too soft and sticky to handle as you would regular roll dough. Place it into a Ziploc bag. Refrigerate at least two hours, overnight is preferred, or freeze for an hour.